The regenerative receiver was very popular among shortwave listeners and amateur radio operators during the 1930s to the 1950s. Their popularity diminished with the availability of war surplus receivers and low cost commercial receivers. Many circuits were designed using various tube types ranging from excellent performers to dismal at the best. 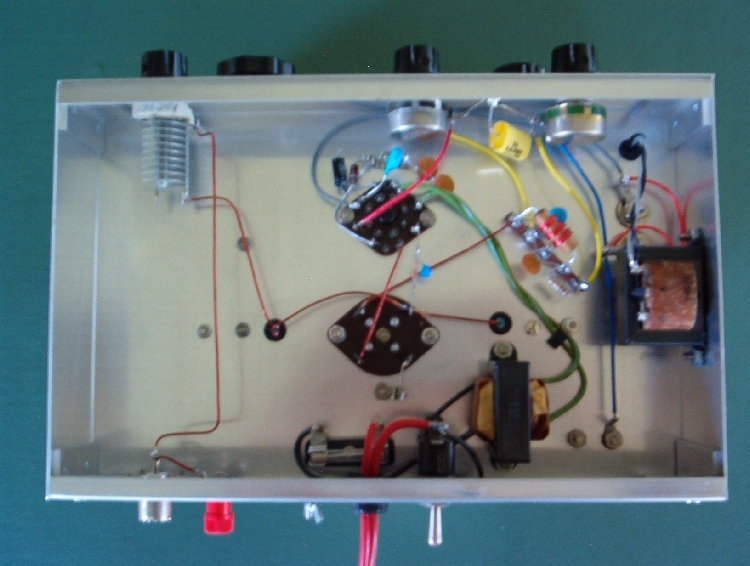 Successful operation of a regenerative receiver requires patience and sharp tuning skills. Neither is difficult to obtain when using a well designed circuit. The 6SL7 Twinplex is an excellent circuit that delivers selectivity, sensitivity and stability. Careful planning in construction will yield surprising results. 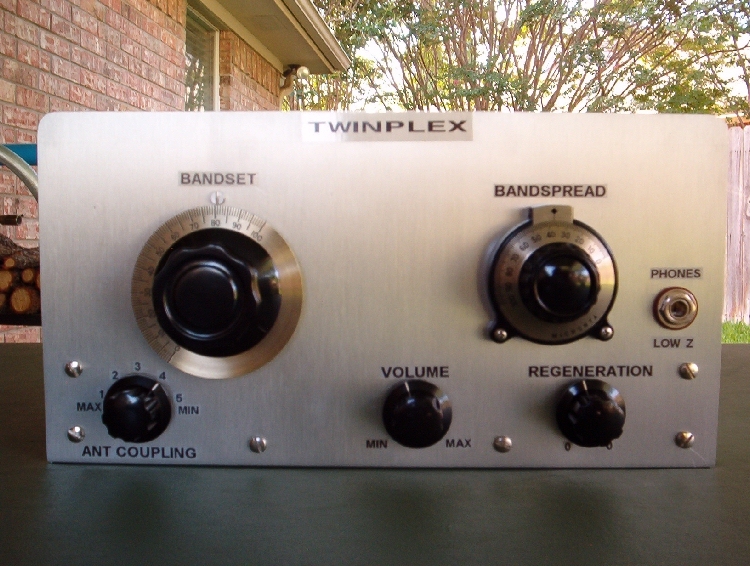 The Twinplex has great audio for AM reception as well as tuning SSB and CW signals easily. The 6SL7 tube is a dual triode with one section serving as detector and the other section as audio amplifier. 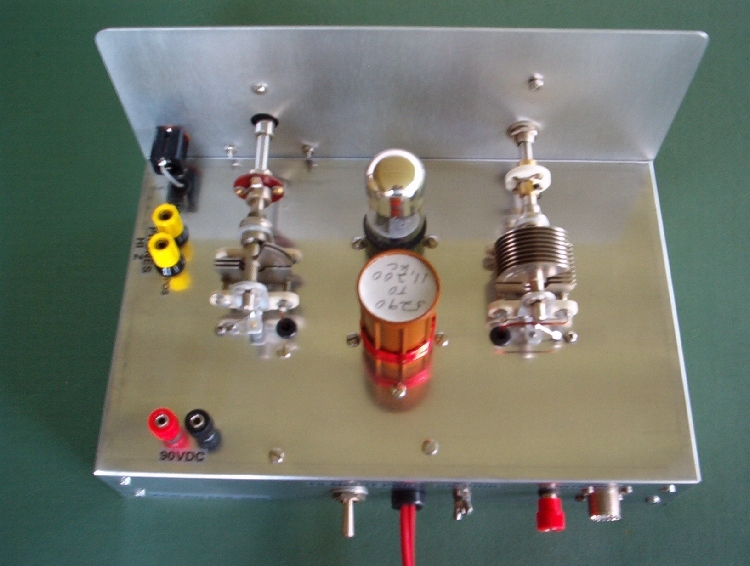 The 6SN7 tube is also very popular in this circuit while having a lower amplification factor. The 6SL7 tube has an amplification factor of 70 while the 6SN7 has a factor of 20. After my experimentation with both types I prefer the 6SL7. Which tube is used is a matter of personal preference. Hand capacitance can be a problem with any regenerative receiver, but can be eliminated with proper construction techniques. Using a metal chassis with a metal front panel is a must while also using a good ground connection. The chassis size measures 7x11x2 inches. Shaft insulators are required for both tuning capacitors. All of the knobs should be nonconductive such as Bakelite or plastic. Many regenerative receivers use vernier dial drives for bandset and bandspread controls. Some type of vernier dial is necessary for bandspread control. Simply using a large graduated dial for the bandset is sufficient. The bandset control is used to set the receiver to a particular part of the band. The bandspread control is then used for fine tuning. Slow turning is required for both controls. Stations can easily be skipped over if tuning is not done slowly. Parts values shown in the schematic are the exact values I used. Performance of my set was so impressive that I never experimented with any other values. The odds are that anyone wanting to build this set would have the exact same variable capacitors that I used will probably be slim. A slight variation in the variable capacitors is acceptable. Using capacitors with a slightly different value will only effect the tuning range. I used Bud 4 pin plug-in coil forms measuring 1 1/4 inch diameter. The coil winding information is to be used as a reference only. Frequency coverage will vary depending on the variable capacitors used and construction techniques. I modified my coils four times before being satisfied with the frequency range. Use enamel covered wire that is 22 ga. to 24 ga. in diameter. This is equivalent to .025 to .020 of an inch respectively. All windings are close wound with .100 of an inch between tickler and tuning coil. It is important to wind both coils in the same direction. Tickler windings are wound on the bottom of the coil form with the tuning coil on top. My first coil has a frequency coverage of 5290 to 11,200 kc using 3 turns for the tickler and 10 turns for the tuning coil, My second coil covers 8510 to 18,000 kc using 2 turns for tickler and 5 turns for tuning coil. If you cannot get your set to go into regeneration try removing one turn from the tickler coil. Adding turns to the tuning coil will lower the frequency coverage while removing will raise the frequency coverage. It is important to note that adding or removing one turn will make quite a difference. Many times a 1/2 turn is all that is needed to obtain the frequency coverage required. Once you have obtained the frequency coverage desired, glue the windings in place as any movement will alter frequency coverage. When choosing an antenna it is important to remember that it is part of the receiver circuit. If the antenna is too long the signals will be loud, but you will lose selectivity, sensitivity and regeneration control. This happened with my set when I tried a 60 foot random wire antenna. Most regenerative receivers are so sensitivity that only a 25 ft. to 35 ft. random wire antenna is needed. When the correct antenna is used regeneration will be smooth and the set will be very selective. The antenna trimmer capacitor is an important part of the Twinplex circuit. If the antenna is coupled too tightly the set will most likely not go into regeneration. Use just enough coupling to give smooth regeneration control. This is usually in the range of 2pf. to 10pf., which means, the plates of the trimmer capacitor will only be sightly meshed. This adjustment will rely greatly on your antenna. Patience and experimentation will pay off here. Powering the Twinplex is not complicated. The 6SL7 and 6SN7 filaments require 6.3 volts. The 6SL7 filament draws .3 amps. and the 6SN7 filament draws .6 amps. 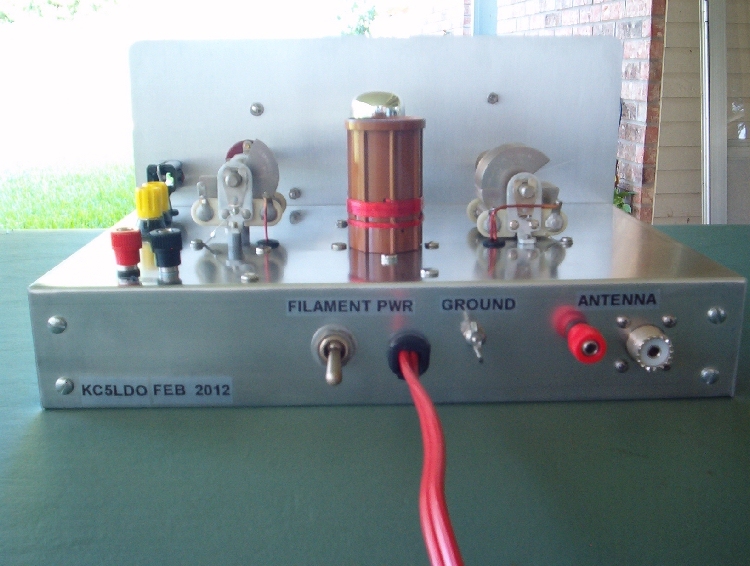 Because of this amp draw it is easier to use a filament transformer and power the filaments with A.C. The filaments can be powered by battery, but battery life would be limited due to the higher current drain. The "B" supply consists of ten 9 volt batteries connected in series to produce 90 volts. The set will operate with lower voltages, but the volume will be lower. The "B" battery current drain is only 2 to 3 ma. Battery life is very good and it should be disconnected when not in use. The Twinplex circuit is designed to use high impedance headphones. Older headphones with 2000 ohms impedance or higher may be used. I originally used a pair of Trimm Professional headphones which worked very well. I decided to use lighter and more comfortable, modern headphones which have an impedance of 8 ohms. To use the newer headphones an audio matching transformer is needed to match the high impedance required of the receiver to 8 ohms. Connect the high impedance side of the audio transformer to the phone terminals in the schematic. The low impedance side of the transformer is usually for 8 ohm headphones. It is EXTREMELY IMPORTANT to note that all of the headphone connections must be insulated from the chassis. After experimenting with several sets of headphones I chose a pair of Yaesu YH-55. They are excellent at hearing weak signals and comfortable. When you first try out your receiver, set the controls as follows: antenna trim and volume to midway; regeneration to 9 o'clock position; bandset and bandspread capacitors slightly unmeshed. Connect your antenna, ground, headphones, battery pack and turn on the filament power. Allow tube to warm up for a minute. Adjust regeneration until you hear a click or hissing sound. The set is now in oscillation. The point where oscillation just begins is when the receiver is the most sensitive. Turn the bandset control slowly until you either hear a station or a squealing sound which is a heterodyne. Adjust the regeneration until squealing stops and you should hear a station. Use the bandspread to tune your stations. Adjust volume and regeneration for best reception. These tips will help you get started with your new receiver and please remember the word, "patience", as mentioned earlier. Using a regenerative receiver takes a little getting used to. I call the Twinplex a real radio because it has five controls and you actually use all five during operation . A hands on radio for sure.